Where can I change/customize the text of the emails I send with LSP.expert? You can write the text you want for your emails. The text of the emails you send using LSP.expert can be changed in Settings > Document and email configuration > Emails tab of the configuration in question. You can format it as you like (bold, italics, etc.) and define a different text for your invoices, invoice reminders, quotes, purchase orders and credit notes. 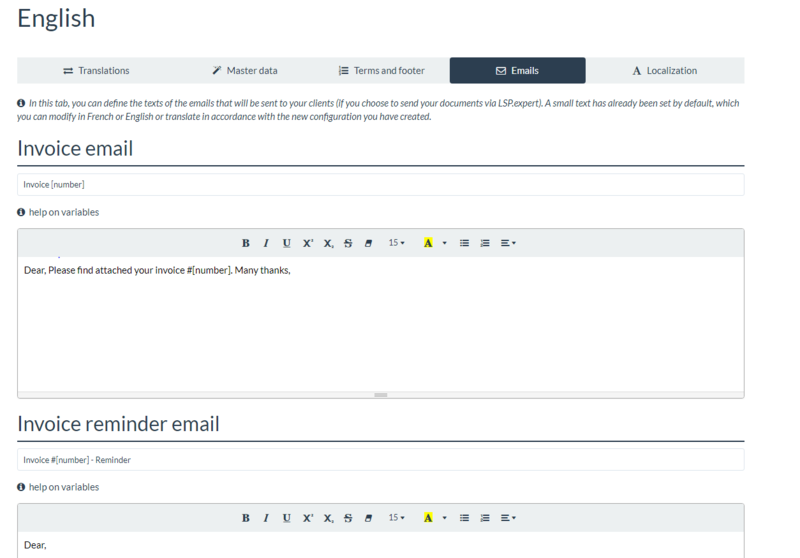 You can insert those variables anywhere you want in your emails and the system will adapt them with the correct info when sending your email. When you're done, click on Save.